"...I highly recommend Pinnacle for tailoring the ISO certification process around a sound business system rather than tailoring the business to a standard." "...Pinnacle was able to demystify the relationship between ISO 9000, Six Sigma, and the Malcolm Baldrige Award criteria for our management team. We finally began to visualize a practical journey toward a high performance management system and an excellence focused organization." Pinnacle's approach is more than just an ISO 9001 or ISO 14001 certification program. It is also more than a Lean tools training program or a Six Sigma Black Belt curriculum. Simply addressing generic requirements and blindly learning advanced quality tools does little to move your organization toward a high performance BOS. 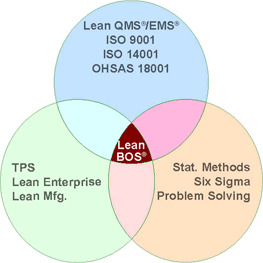 Truly maximizing the value of your BOS mandates an integrated Lean BOS® approach, a sustained mind set, and proficiency that must be acquired through "knowledge transfer." For the long-term viability of an organization, the rationalization and integration of the business, quality, regulatory, and technical processes must be permanent. Pinnacle's mission and purpose is to help organizations achieve business excellence through the rational development and improvement of the business system. The in-depth experience of our progressive staff and our innovative approach to business process improvement, Management System implementation, and organizational development is reflected in our broad array of services. Pinnacle is committed to providing the highest quality, custom tailored, and affordable training and consulting services to help organization along the road to organizational excellence.